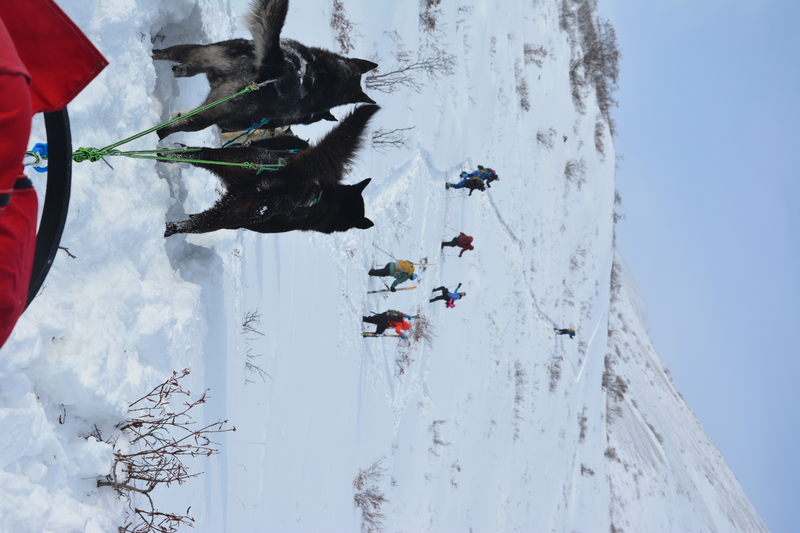 Ski trips in Denali with Sled Dog Support! 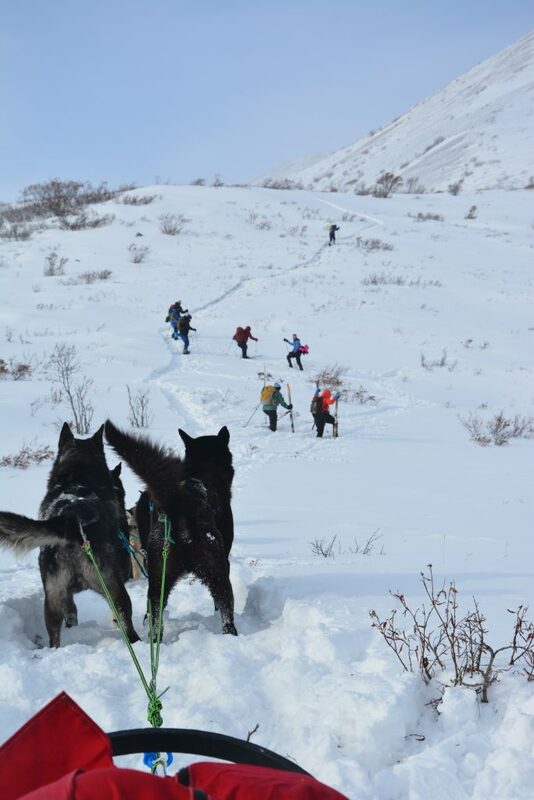 Denali Dog Sled Expeditions offers experienced cross-country skiers an amazing and unique adventure opportunity…multi-day Alaska ski tour with dog team support. You can ski from cabin to cabin with just a fanny pack, while a dog team hauls all your gear. The guide will have a warm cabin waiting for you, and offer all the trip support that our passengers get. There are few opportunities like this anywhere, traveling by ski for extended periods of time into wilderness without hauling heavy sleds or skiing with heavy packs, or going along with snowmachines. For the backcountry ski fan, this is an ultimate trip with enough comfort/luxury at night in the cabins to satisfy anyone! As with the dog sled tours, we offer some set trips, but also can customize tours to meet guests needs and desires. Prices for trips vary, depending upon group size. We can take 4-6 people per trip, and we prefer to book groups that all members know each other (and are familiar with each others’ skills and limitations). If your group is only 1-2 people, we still may be able to fit you in for a trip, either going as a smaller group or combining small groups together. It is very important to completely fill out member profile form we send you to match you up with the proper trip and team members. Trip rates do not include airfare for fly-in/out trips. Airfare costs fluctuate, and we can give you estimates when you reserve a trip. 8 Day Wonder Lake Fly Out Ski Tour is available in late February and March, 2020. Only a few slots are still open. 5 Day Igloo Creek Cabin tour is available in February 2020. 5 Day Wonder Lake Base Camp Fly In/Out has very limited availability for March 2020. 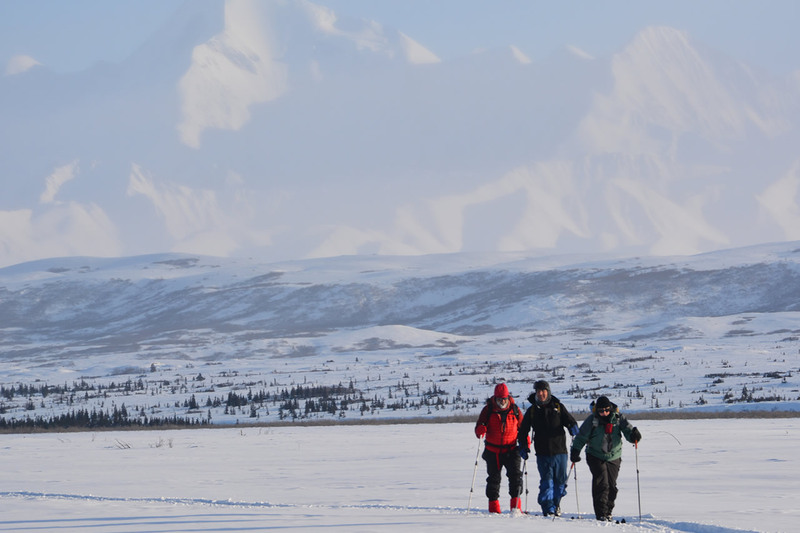 There is still limited availability for custom trips out the Denali Park Road Corridor for January and February. Contact Jon for information. This trip is similar to our one-way dog sledding tour, but it starts near Park Headquarters and travels the Denali Park Road Corridor. Ski distances between cabins range from 7-17 miles, so the shorter days allow for some exploration around the cabins. Trip either begins or ends with a scenic flight out from either Healy or Talkeetna. Trip offered mid-February to early April. 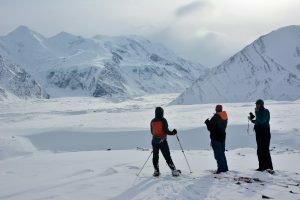 This trip flies the skiers in and out of the Kantishna Airstrip or Wonder Lake, so the entire trip is within sight of and relatively close to Denali. Cabins are used near Wonder Lake, and a heated tent is set up at Upper Cache Creek for a ski/hike up to McGonagall Pass…the pass through the foothills that accesses the Muldrow Glacier. The view from the Pass is unequaled in the world, just seven miles from the base of Denali, hovering above the junction of the Muldrow and Traleika Glaciers…two of the larger glaciers in the park. We set aside two days at Upper Cache Creek in case of weather, and also have some built-in flexibility with this trip. Trip offerend in March. The five day trip is similar to the eight day McGonagall Pass trip but less ambitious, spending time doing day trips out of Wonder Lake, with some options for overnights nearby. Trip offered in March. Explore the eastern end of the park with this ski trip that goes to Igloo Creek cabin, with a day there to ski up Sable Pass, and back out. This trip needs no air support or transportation, so it is a bit more affordable. Distances between cabins are 7-12 miles, so it is more casual. Trip offered most of February, possibly in March.